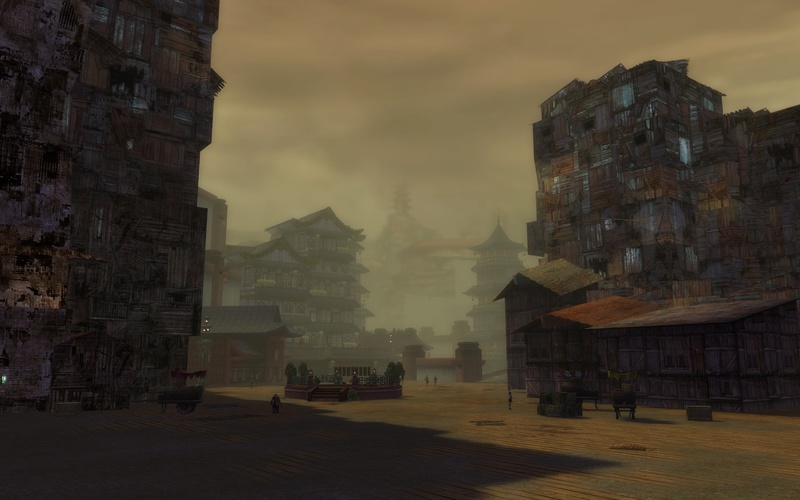 One would hope that visiting the Xaquang Skyway would smell a bit better than lower places such as Wajjun Bazaar or the Undercity, but it does not. The wind picks up the foul stench of garbage, sewage, and decay then brings it to the skyway. 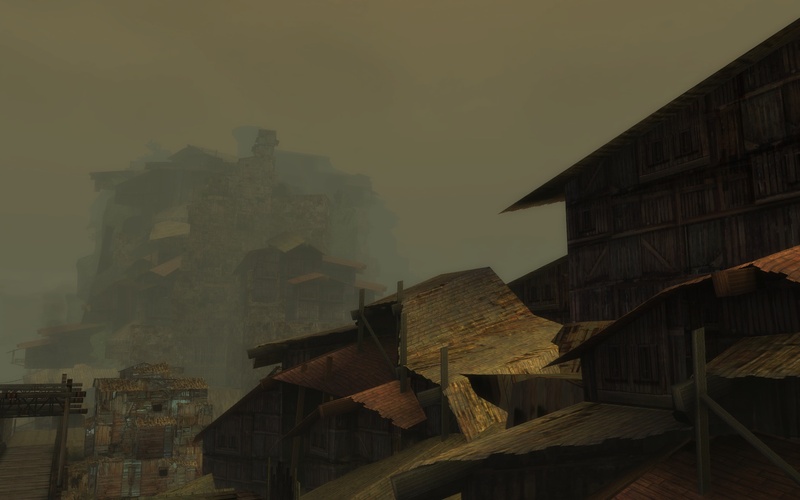 After exploring such places as the Maguuma Jungle and Shing Jea, having to explore Kaineng City makes me feel ill. However, the smell did not stop Xia H. D., Catfish J, Vengance H., Harlequin H., and Oops W. M. from helping me explore this area. 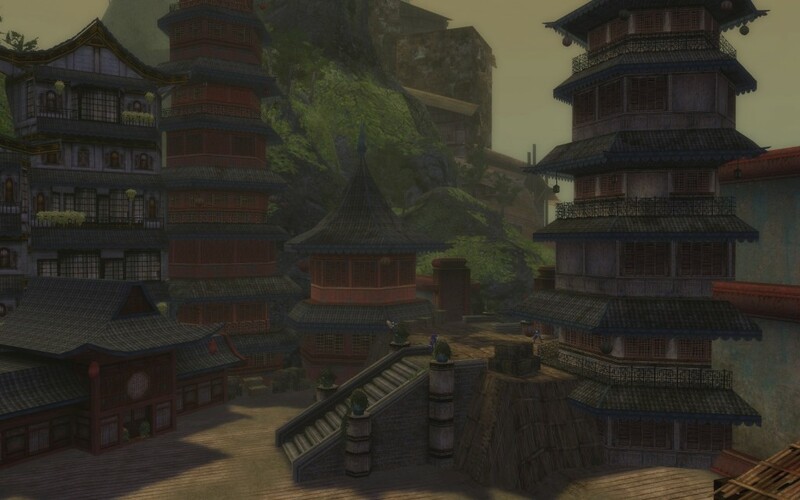 I was standing on the bridge, looking down at the area below when Catfish alerted us that a group of Jade Brotherhood members led by Orosen, Tranquil Acolyte were running this way. Luckily for us, Orosen was not a channeling ritualist so it was fairly easy to take care of his group without any casualties. 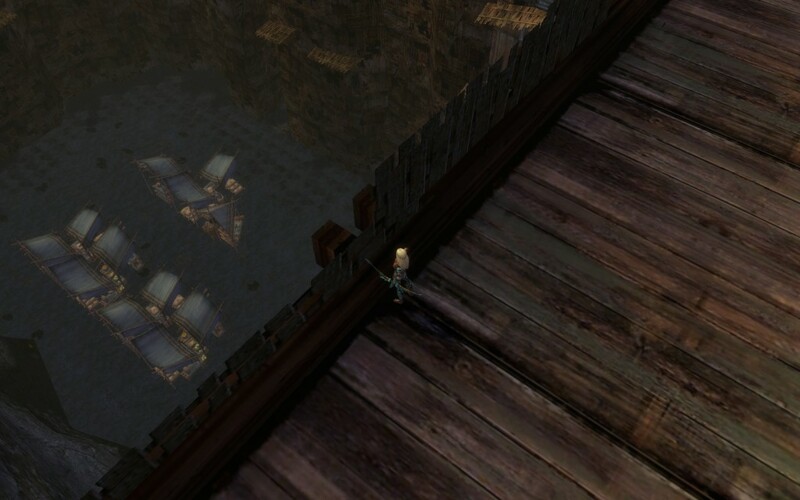 With the bridge clear, I could finally have a good long look below me. 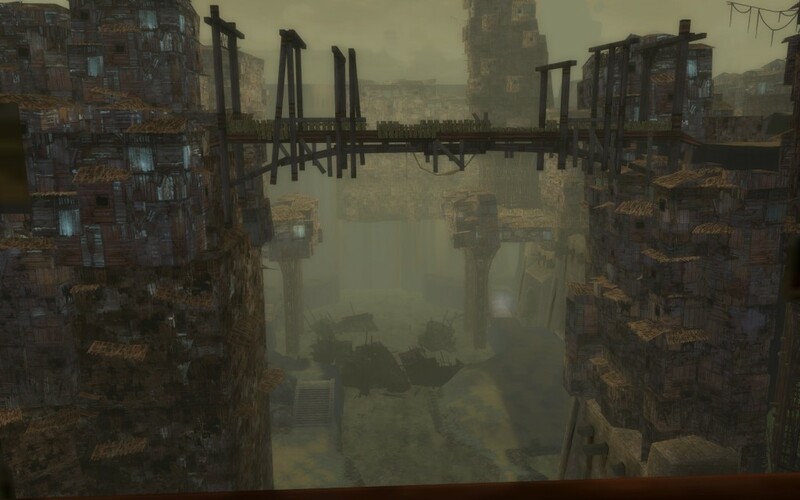 According to my map, most of the skyway is above the Undercity. This water fountain is slightly off the map though. On the other side of the same bridge, I could see some a small marketplace. 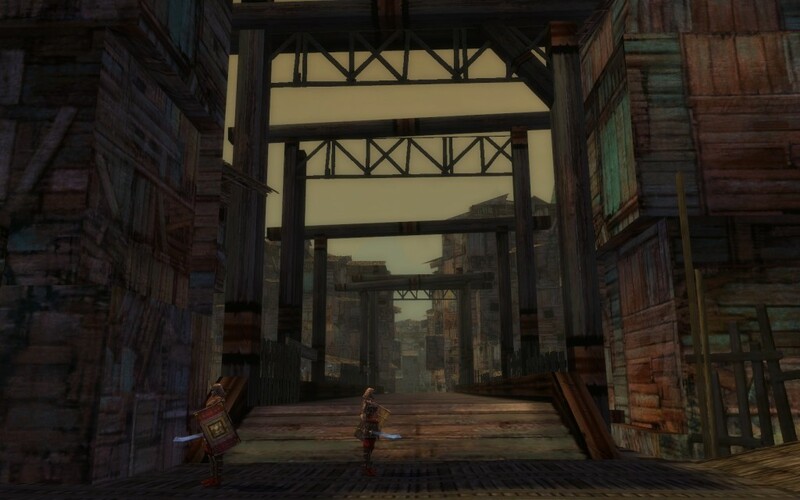 Further up the bridge, part of the Undercity could be seen. Kappa inhabit this portion where there is shallow “water” and large sewage pipes further back. 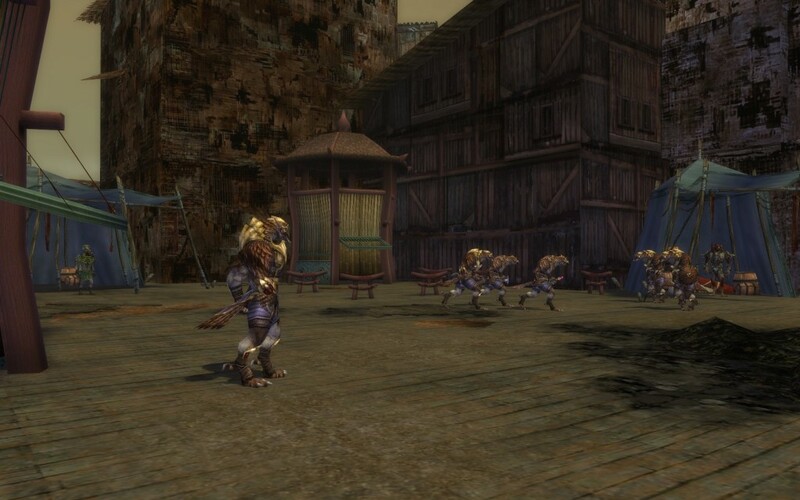 Friendly Angchu Tengu gather at The Roost; their only safe haven in Kaineng City. Still, they are often harassed by Canthans of all status. The tengu wars are still fresh in everybody’s mind. The wars began when Canthans unwittingly passed diseased onto the tengu and their hatchlings. The tengu retaliated and war broke out. It will be quite difficult for Canthans to learn to trust the tengu again, especially with the Sensali Tengu still aggressively attacking Canthans on sight. Standing on the rooftops is a great way to survey the area. The Jade Brotherhood members are all over the skyway, even in the nicer areas. 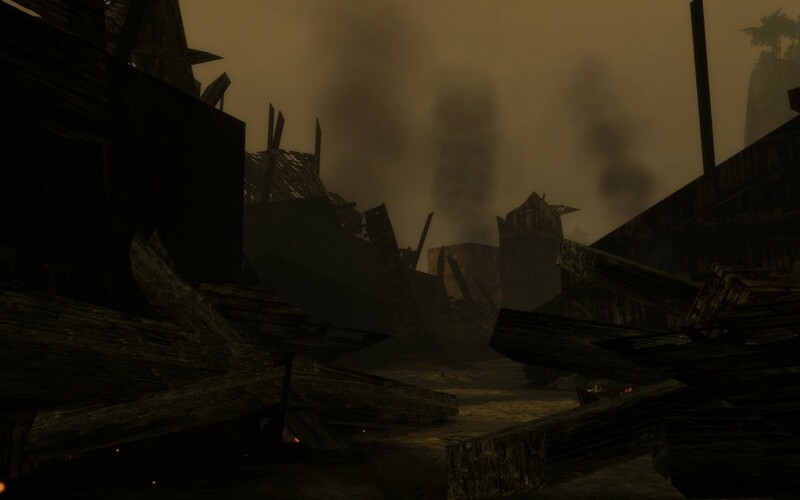 To the west lie the charred remains of houses and a large group of vermin. Not only do I have to put up with the smell of the city, but now also the smoke filling my lungs. 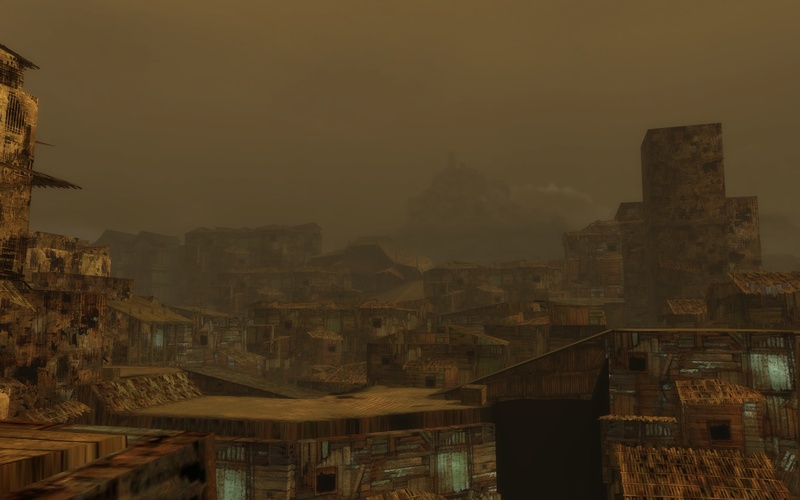 If I were not an adventurer, perhaps I would be living amongst the poor of Cantha in the many slums. Thank the gods that my parents were able to get me into Shing Jea Monastery! 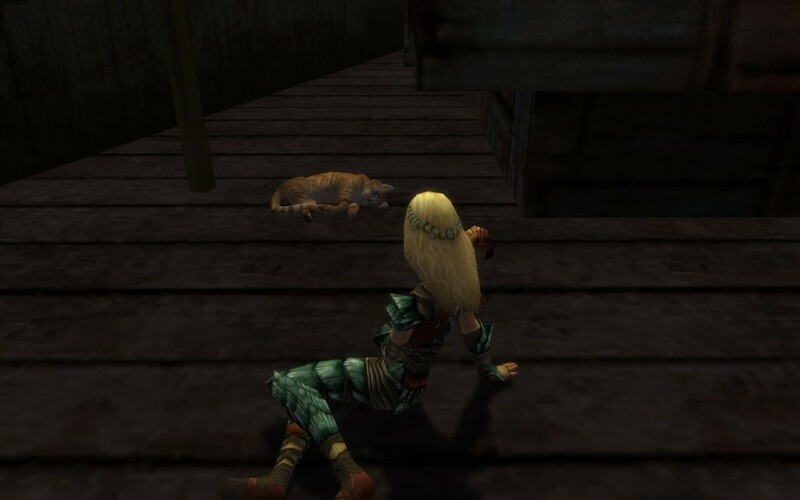 There seem to be a lot of cats in the city, I found one just like this earlier in Nahpui Quarter. With almost a full group of friends, it didn’t take very long to fully explore Xaquang Skyway. At the end of it I asked our monk if he had a some kind of weird skin affliction, but he reassured me that it was only paint. I thanked my friends Oops W.M., Harlequin H., Catfish J., Vengance H., and Xia H.D. for their company and assistance. Friends: Xia H. D., Catfish J, Vengance H., Harlequin H., Oops W. M.